I absolutely adore Spanish tapas, and Spanish meals often remind me of my enjoyable visits to Spain with lovely weather, friendly people and (lots of) Sangria. 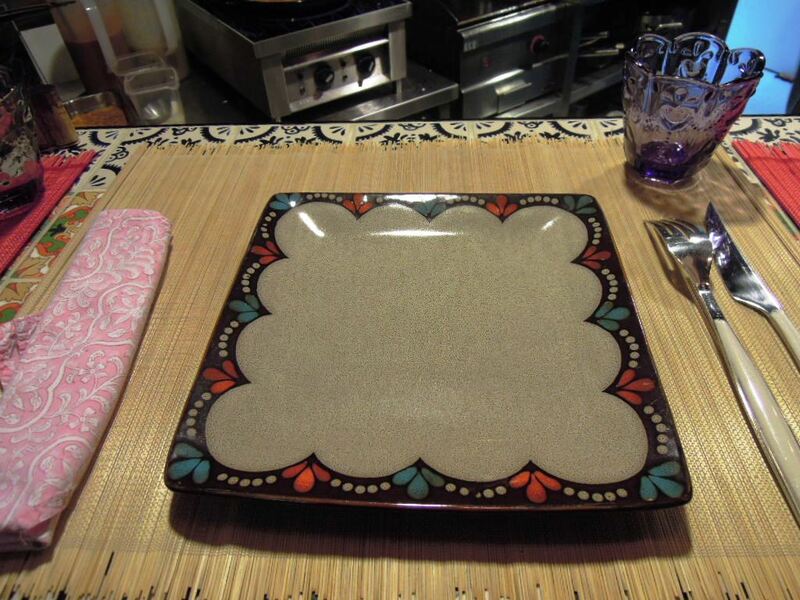 Inconspicuously located on Peel Street, BCN is a tapas bar that only seats 12 people. 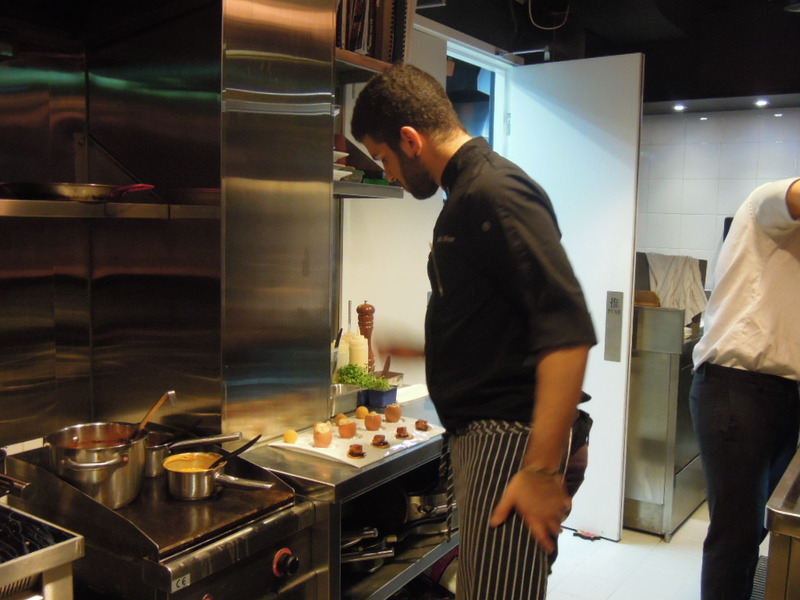 With the chef preparing your dishes right in front of you, BCN feels more like a private kitchen than a restaurant. Admittedly, my first impression of the restaurant was not great. 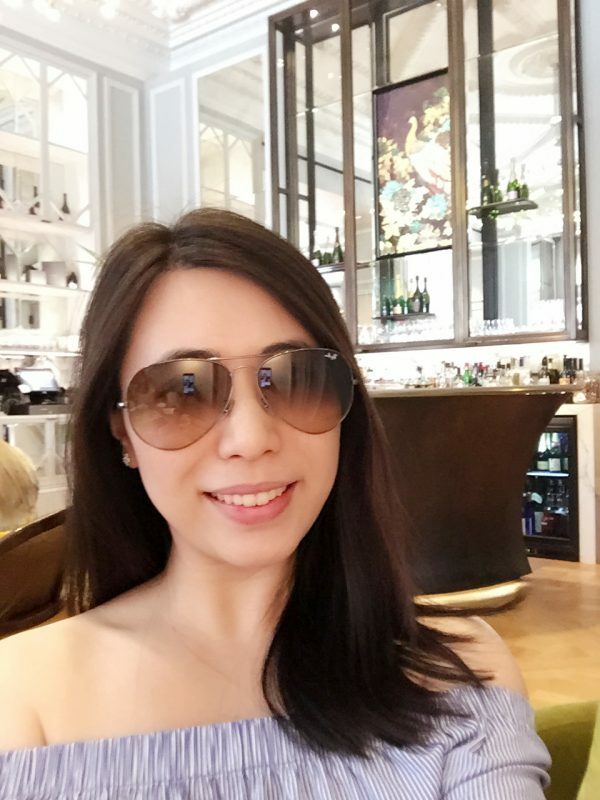 The restaurant is not open for lunch, and due to its popularity, there are two seatings for dinner – one from 7-9pm, and the other from 9.15pm onwards. 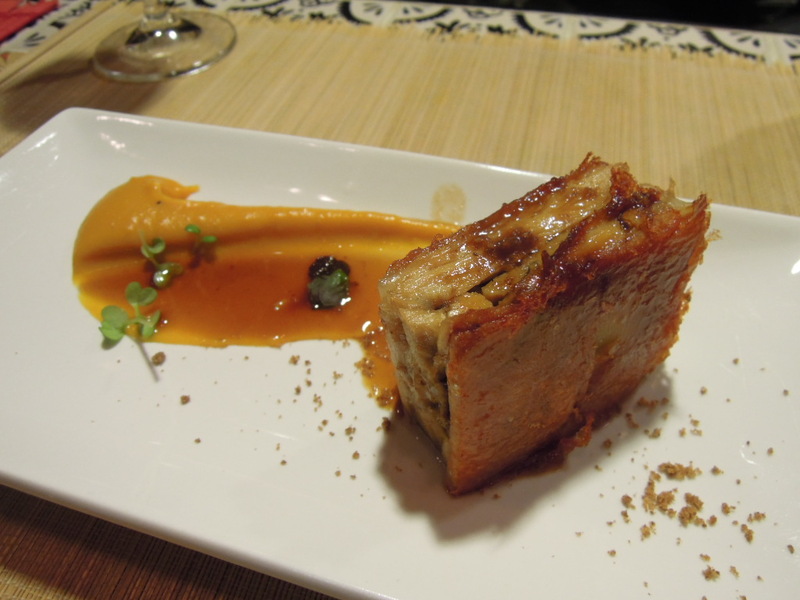 There are two menus to choose from: “Trip to Spain“, at $580, and “Chef’s Menu“, at $680. As the set dinners at BCN are not cheap, I was somewhat dismayed by the short time allowed at dinner. 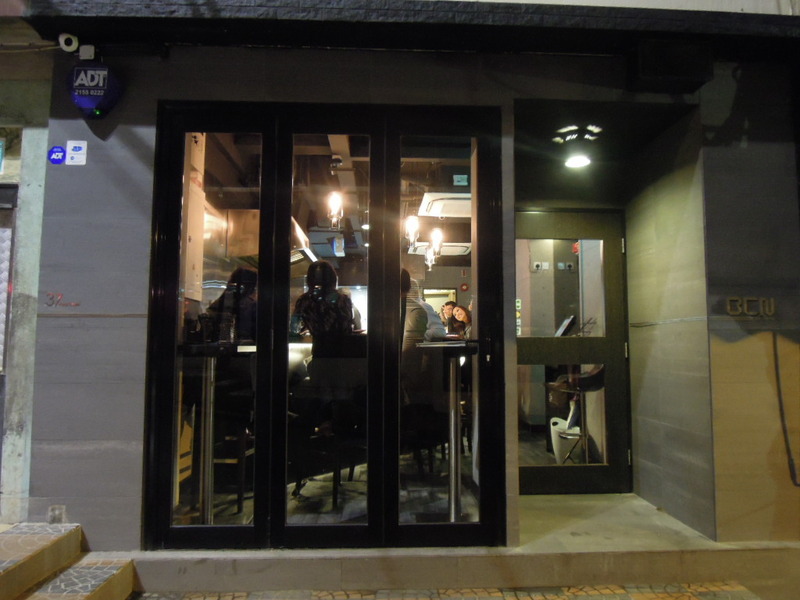 I went at 9.15pm and our seats were not available until 9.30pm; on the other hand, my friends who booked the 7-9pm slot said that they felt quite rushed to have to finish 6 courses by 9pm. 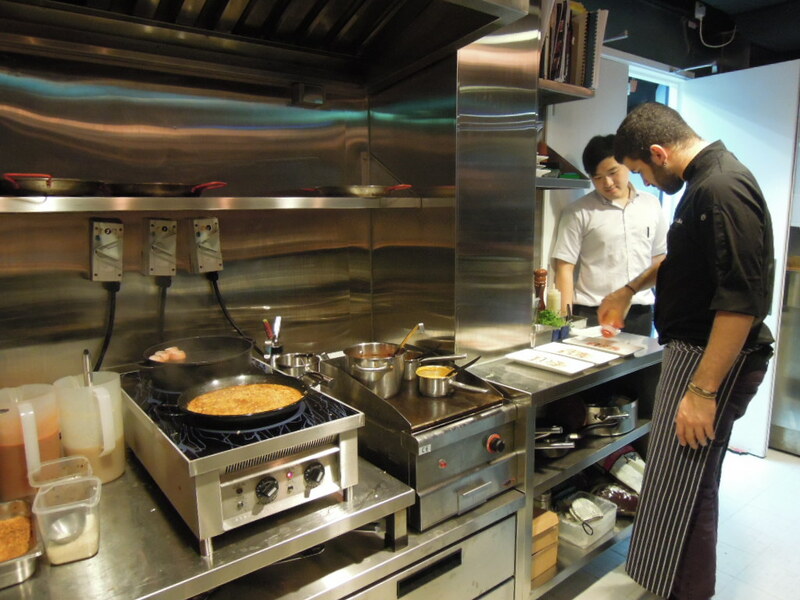 The chef at BCN is Edgar Sanuy Barahon, who has worked at Michelin starred restaurants, Restaurante El Rincón de Diego and Restaurante “El Torreó de l’ Indià, in Spain before coming to Asia. Edgar is known to be amiable and friendly, but he wasn’t there on the day I went to BCN. 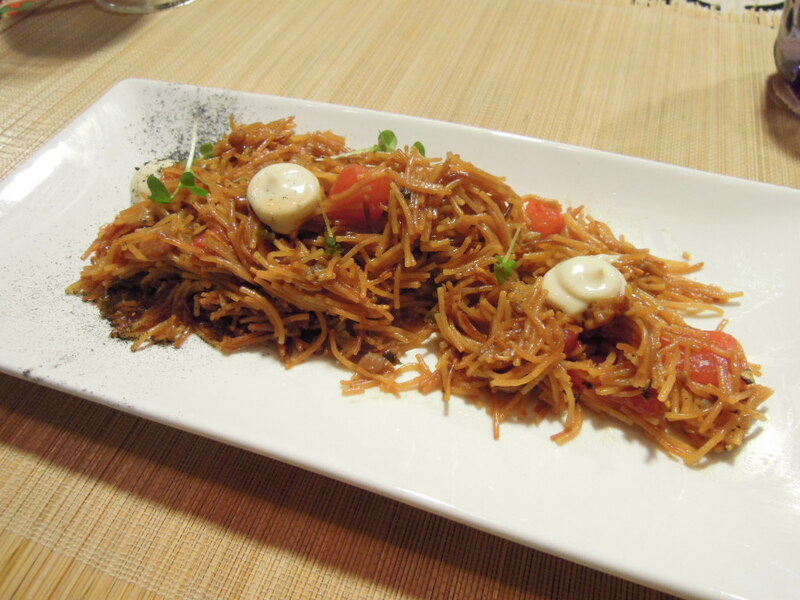 We chose “Trip to Spain”, as the portions at BCN are huge and we thought there would be too much food if we ordered “Chef’s Menu”. Having said that, “Chef’s Menu” looks very attractive, and the BCN paella rice with red prawn, in particular, sounds enticing. 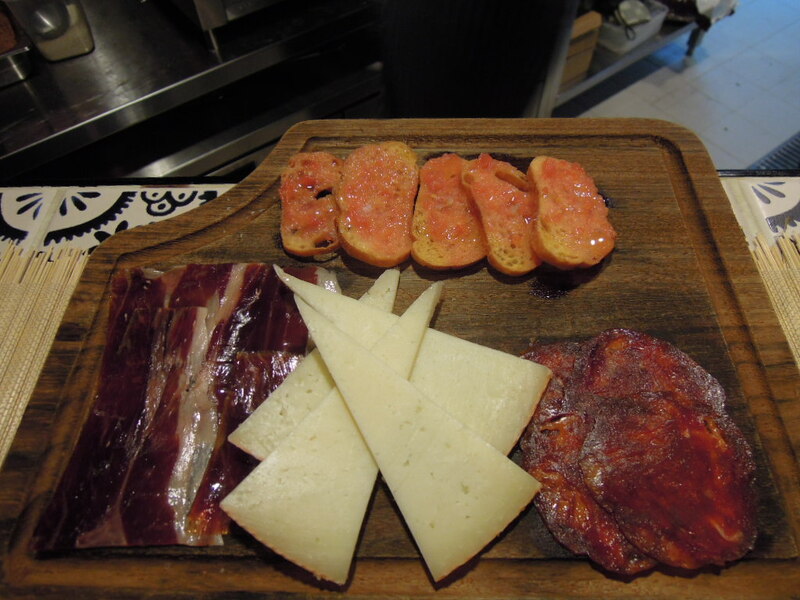 (1) We started off with the Cheese, Spanish ham from Iberico pork with 100% natural feeding and Chorizo set. The ham was pristine, and was packed with flavours and perfectly fat-flecked. The cheese had a beautiful and fine taste. 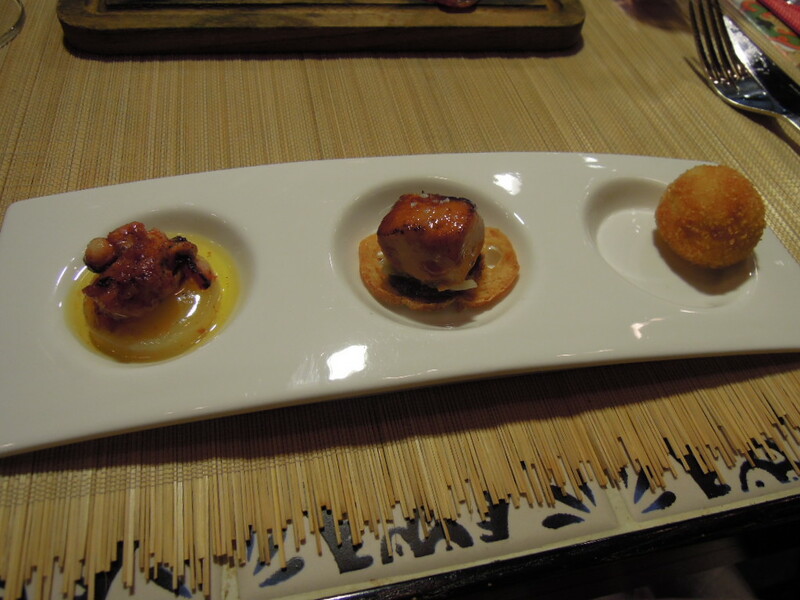 (2) Second on our menu was a 3 Small Pintxos Set. Each pintxo was small, delicate and delicious. On the left was an octopus, bathed in olive oil, which was fresh and chewy; in the middle was a hot fried croquette, which was alluringly crunchy and light; on the right was a small piece of foie gras on toast, which was silky and tasty. Perhaps what made the food at BCN so delicious was the fact that it was all freshly prepared right before it was served. 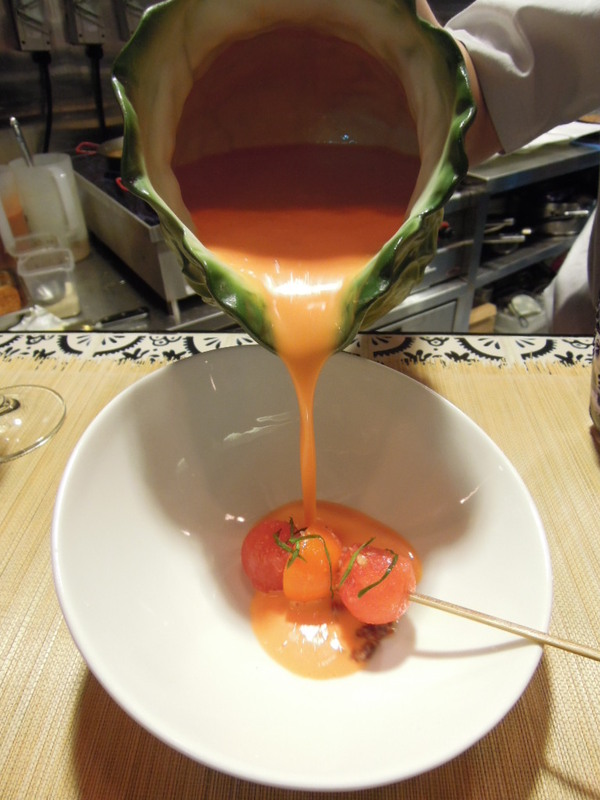 (3) The Classic cool soup “Gazpacho” from Andalucia, with tomato, watermelon and basil followed. After some tangy pintxos, this soup, which was cold and refreshing, was just what was needed. It was natural and fresh, with a strong tomato flavour. 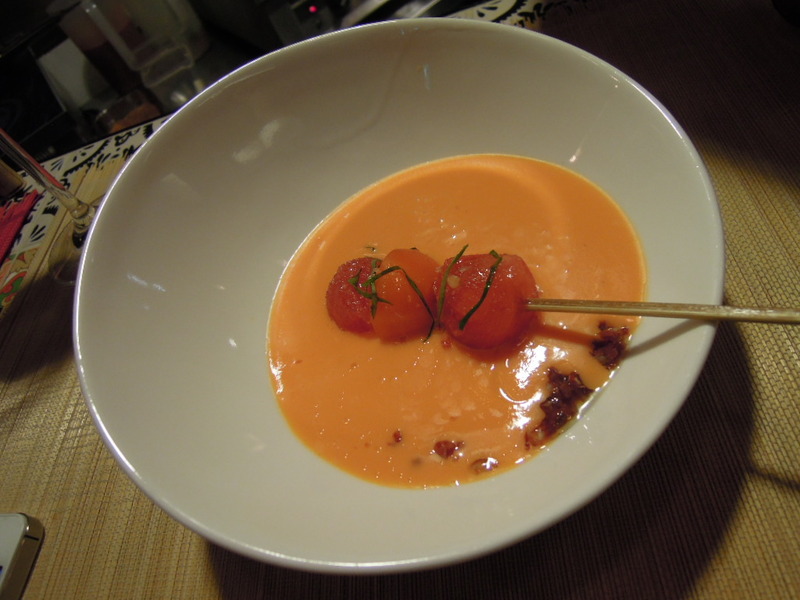 The peeled tomato and watermelon went very well with the soup, and added crisp textures to it. (4) The Fried short noodles, cooked in seafood soup, with fresh tomato and oil&garlic sauce was a job well done and was one of my two favourite dishes of the night. Each noodle was completely soaked with flavours from the seafood soup, and the noodles were soft and smooth without being mushy. The fresh tomato gave a slightly citrus note which was complementary to the dish, and the of oil&garlic sauce provided extra richness. (5) My other favourite dish was the Suckling pig slow cooked with vapour, with sweet potato cream and spanish meat sauce. It was almost half past ten when we had it, but it was worth the wait. While the the skin was wonderfully crispy and cracker-like, the meat, having been slow cooked for 10 hours, was fantastically tender and supple and was melt-in-the-mouth soft. Some sweet potato cream was thinly spread on the plate, and it was mild and indulgent – just the right thing to enhance the flavours of the pork. 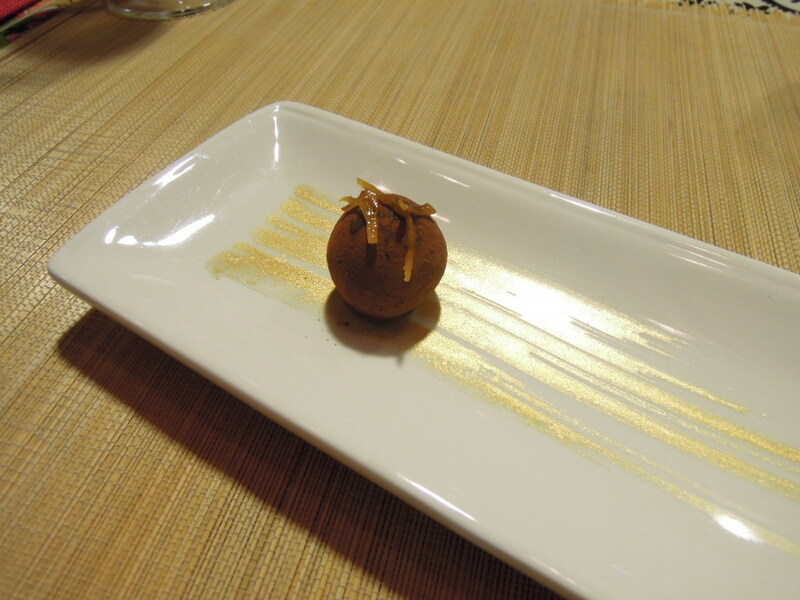 (6) Our last course was a Chocolate truffle with orange skin. The chocolate had an alluring, deep chocolate taste and had a smooth and creamy filling; the orange peel gave a fresh, bright note to the chocolate. However, despite already being very full, I could not help feeling a bit disappointed that we didn’t get a proper “dessert”. Conclusion: There were certain aspects of the meal that I was not completely happy with: firstly, the price was expensive for Spanish tapas; secondly, despite the amount they charged, dinner was divided into two seatings; and thirdly, the restaurant was very narrow and our stools were not the most comfortable. However, the food at BCN was indeed mouthwateringly good and the dishes were all freshly prepared and meticulously executed. I guess I will just have to get over some of BCN’s shortcomings, as I will be coming back here for more tapas!